"A Day With A Horse!" My goal as a video-maker is to create videos that people can be proud of, that attract the customers they want, and tell a great story. When I got to experience 'A Day With A Horse' with Tracey, I was inspired on every level. Tracey is kind, comfortable and unique, and always has a story to tell. My day with my horse was an incredible experience that will forever change the way I see animals. On my way home after my riding at Pinto Valley, I thought that this was a story that I just had to tell. This story became the first video for AmberWolf, my Ottawa based video production company. I couldn't be more proud about this story and that I get to help Tracey attract people to have the amazing experience that I had with her and her horses. I want to live in a world where people enjoy the work that they do, and every video AmberWolf creates is our little contribution towards that cause. 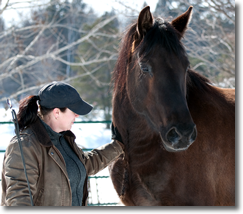 The horse and their partner will enjoy a one hour guided trail ride at the end of the day. We will ride through the scenic trails that Mother Nature has carefully decorated. Relax and enjoy! It is said that experiences are better than things...This is a great gift idea for that special someone! Please pack your own lunch, Complimentary coffee, tea and water for the day.